If you want a podcast to automatically stop playing after a designated period of time, the little-known Sleep Timer feature in Podcasts for iPhone or iPad is for you. Much like the name implies, Sleep Timer will play a podcast until a specified time completes, or when the current episode is done playing, and then the podcast automatically stops playing. Sleep Timer on Podcasts for iOS is great for people who like to listen to podcasts before sleep, while going to bed, while exercising, on a consistent commute, or performing other tasks where it’s appropriate to end a podcast in a determined amount time. The Sleep Timer feature of Podcasts has long been available, but with the latests versions it is hidden within the Podcasts app, tucked underneath a gesture that many iPhone and iPad owning Podcasts app users probably don’t even know exists. But not to worry, we’ll show you how to access the feature and use it to automatically stop playing a podcast in an allotted time. In the example screen shots here, the Sleep Timer is configured to stop playing the podcast “when current episode ends”. You can also cancel the Sleep Timer at any time by swiping back to the hidden section of the Podcasts area and then again tapping on the Sleep Timer moon button. 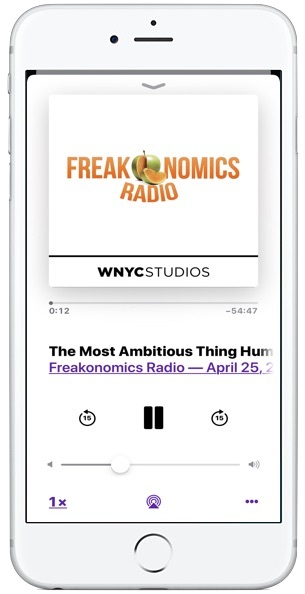 Many Podcasts users may not even know this feature exists, probably because it’s tucked behind a swipe-up gesture that there isn’t any particular indicator for. Just don’t swipe up from too low on the screen otherwise you’ll access the Control Center on some iPhone devices, or you’ll go to the Home Screen on the iPhone X style device, as that swipe-up gesture performs various tasks depending on the device in use, and where the gesture for swipe up begins from in the first place. That makes Sleep Timer a bit of a hidden feature, but whether it’s hidden in the Podcast app interface or not, it’s just as useful in the end. And now you know about it, so it’s no longer hidden for you anyway! Of course this is for Podcasts, but you can do the same with Music if you’d like thanks to features that allow you to fall asleep to music on a timer on an iPhone, iPad, or iPod touch, and a free third party app lets you play iTunes music to sleep on a timer on a Mac too. It’s not just the official Podcasts app for iOS that has a sleep timer feature though, an the excellent Overcast app for iPhone also includes a sleep timer feature to stop playing a podcast automatically after a predetermined amount of time. Do you know of any other helpful or interesting tricks for podcasts, or timing app behavior to cease after a determined amount of time? Then share them with us in the comments below! I use sleep timers for Podcasts and Music when I need to do something for a set amount of time. For example, need to do 30 minutes on the exercise bike, setting the limit is perfect with sleep timer, because you set it, forget it, and suddenly the time is up. Boom, done. Easy. Works great on iPhone! It appears that this function is also available in OverDrive for audio books. I already knew about this facility but I would like to be able to lock it in. Everytime I start a new podcast I have to swipe up to change it as the default is off. WTF ? iOS has a generic option for ALL apps for this, just set a countdown for how long you want in the timer app, and tell it to play “stop music” this way you can stop youtube, twitch, anything…. Where is this magical universal iOS option to sleep all apps after usage? Your imagination does not count. Oh, it does not exist, that’s right. There is no “Timer” app. This is how you sleep a podcast. You can sleep music in the Clock app. That’s it. WTF indeed, lame! Can you set this timer with Siri? I’ve tried a few commands and can’t get the timer to start using Siri. @Derpus Maximus you are correct, there is no timer app.